Giorgio Agamben, Means Without an End, Notes on Politics, Minnesota, University of Minnesota Press, 2000, p.53. Hito Steyerl likes to quote the Italian philosopher, Giorgio Agamben (°1942), a man who seems radical and who questions Western political views, in texts in which he regards the fugitive, instead of the civilian with a passport, as the basis for a political philosophy. To him it is not the city that is the paradigm for modern politics, but a camp, such as Guantanamo Bay, but just as well a space in an airport where illegal immigrants are detained. The fact that Steyerl is strongly concerned with the exclusion and the cancellation of the normal order, is due to certain events in the nineties. 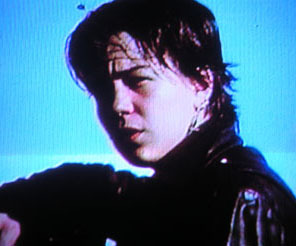 When she was seventeen, Steyerl had a very close friend, Andrea Wolf. She was a militant in extreme left circles, so active, in fact, that she was suspected of being involved in terrorist acts, particularly the destruction of a refugee camp. In Germany a search warrant was out against her. In 1996 she suddenly disappeared. Only two years later did Steyerl receive shocking news about her. Her friend had been shot as a Kurdish rebel in East Anatolia. Andrea had become a member of the PKK, the Kurdistan Workers Party. She took on a new identity, was named Rohani, trained and mainly lived in camps in Nothern Irak. In October 1998 her unit was ambushed by the Turkish army near the border. It came down to a terrible shooting whereby Turkish helicopters were also deployed. Only a few women of the PKK unit stayed alive by hiding in caves. According to witnesses of survivors Andrea was captured and executed, either by Turkish soldiers or by Kurdish civil guards. Giorgio Agamben, Means Without an End, Notes on Politics, Minnesota, University of Minnesota Press, 2000, p.79. The video by Hito Steyerl transcends the individual story and is about the terrorism that in earlier days had been described as internationalism in certain circles. It’s about the gestures and the poses that go with it and how they resemble characters from popular culture and cinema. Coincidentally, when they were seventeen, Steyerl and her friend Andrea had made a small feminist fiction film about female military prowess,. That’s the starting point for the video November, to which she further adds film and travel footage. It’s not a documentary about Andrea Wolf, nor about the situation in Kurdistan. It’s more an attempt to show what comes after October, when the revoltution is over in the person of Andrea and when only the gestures of the revolution live on in our memories.